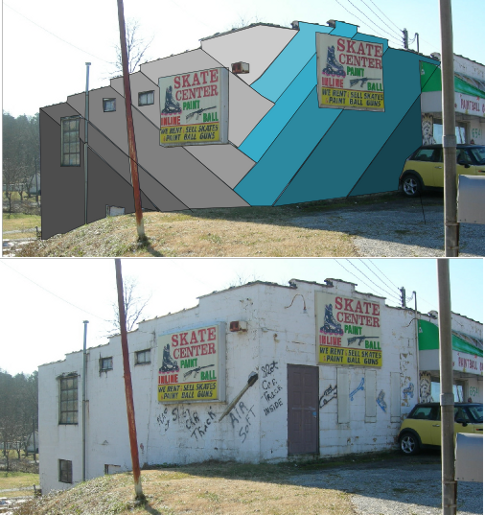 I once wanted to paint murals on run down looking walls in Knoxville. The picture here is an offshoot of what I had in mind. I absolutely loath the architecture of this building, so it was a perfect challenge. It needn't be a time consuming mural, maybe no design at all. Somewhere along the line, I realized that I'd rather work closer to home, which is Seymour. As time goes by, I keep having more and better defined ideas. Here are most of them, no particular order of priority: The goal is to improve the quality of life in Seymour Tn. On a related note, studies have shown that where buildings and grounds are allowed to deteriorate, with broken windows, litter, and old paint; then the criminal element takes this as a sign that people don't care as much, and they move in. Also, if possible, improvement would include creation of jobs. I once thought less of jobs created by tourism, but in this place, that needs reconsidering. Here in the hills of Appalachia, we don't have vast farms or mining operations. There once were more factories, but now are less. So bringing money in from more affluent areas isn't such a bad idea, I just don't want it to be by means of Federal debt spending. When I first moved here, I painted the metal sign that said “Welcome to Seymour”. It was/is located up on the hillside right where Chapman Highway crosses the Knox county line. The paint started to peel on it, and bushes grew up in front of it Someone made a newer, smaller welcome sign a little farther into Seymour, where a pawn store was. I was going to repaint the metal sign with large caligraphy type lettering that said “Welcome to Seymour”, and a web address below it. D.H. Wants to make a website called See more in Seymour.com; the site will be a hub where businesses, churches, and others can put a link to their website. I took the sign down, with those intents in mind, but was interrupted by our household move to East Union Valley Rd. Now, however, I'm glad for the interruption. I'm thinking of a revised layout. Now, I want to skip the “Welcome...” part altogether. There's already a sign saying that, and besides, we have to get as serious as we can, so let's cut to the chase. I want to paint a collage of scenes from Seymour. At the top would be a few in that black and white (Sepia?) look, to let people know that there is a rich history here. The rest of the scenes would be in color, and would be of things one can do here. Racing, rodeo, dining, cycling, equestrian activities, classic cars and whatever other scenes we could show. What about making bright yellow “FOR LEASE” signs, that we loan free of charge to vacant businesses in Seymour? There's a chance it could help fill the vacancy, and make a job or two. Knoxville has its Dogwood trails, could Seymour have its own History Trails? One could be on Boyds Creek Road. The intersection with Old Sevierville Pike is an important one, that could be the start. Go out Boyds Creek, and see old houses, including Wheatlands, and the parsonage at Rocky Springs Presbetarian Church. The old steam train ran through here. Continue on to Indian Warpath road, go left, follow it to East Union Valley Rd. Maybe turn in towards Union Valley Church. Come back to East Union, see some structures there, like the cabin from the civil war era. A little farther is the house I'm living in now, built in 1900. Next to it is a hand hewn two crib cantaliever barn. Go on to Porterfield Gap Rd, see the old hand made bridge remnants. Turn on to Fagely Drive, where a mill and pond once were, the pond that's there might be the old one. Come out on West Union Valley Rd, where there's a stretch of the old Union Army Rd. There's the barn that “Slick's” family built, with its unique cupola on top. There's more history right in that place than I want to type out right now. Then turn on to Old Sevierville Pike, go past Trinity View Church, and complete the gap. I'm not sure that a lot of people would be interested in going around looking at old buildings and small signs; but there may be an alternative. Some cities have so many murals painted in them, that tourists go there to see the art work. Would it be possible to make murals on barns along the route? This would be informative and visually rewarding. I have some ideas about content of some of the murals, but that will take awhile to write out, along with sketches. Even if these ideas were successfully implemented, I don't know how many jobs would be created. Maybe just another employee added at the convenience store, but I think there's potential for more. For instance, there is a REALLY neat house that has been considered as a possible bed and breakfast. It's along the route, they might benefit. Then too, somebody would have to make and sell T-shirts and such, along with a number of regional things that could be made here. I have a list of some of these things, and there could even be a book about the area, the people, and the unique, fun stories they can tell. What concerns me is the possibility of someone taking these ideas and having them made elsewhere, those jobs would be lost. Again there may already be a way around this, I want to discuss it with the right people.